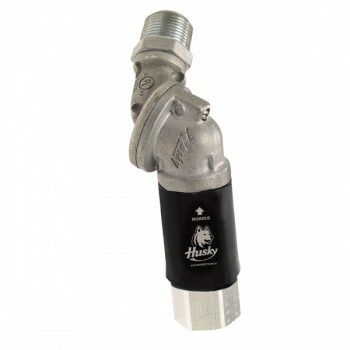 Husky® Model 005969 Swivel-T-Break® Combination for truck and high volume fueling. • Swivel Sync® feature to prevent separation failure in the 90° position. • Dynamic seals have double o-ring construction for long life and low temperature performance. • Separates at less than 325 lbf / 1,445.6 N which minimises backlash fore of separations, reducing damage to equipment. • 008015A and 008985A separate at less than 300 lbf / 1,334.5N. • Safe-T-Break® is reconnectable and retains UL listing after reconnecting. • Dual check valves stop fuel in both directions. • Compatible with Ethanol blends through E10. • Easier to reconnect when installed at nozzle. • Eliminates the need for a whip hose.